EXPOSURE Skate will be at the Encinitas Community Park on Saturday November 5th. 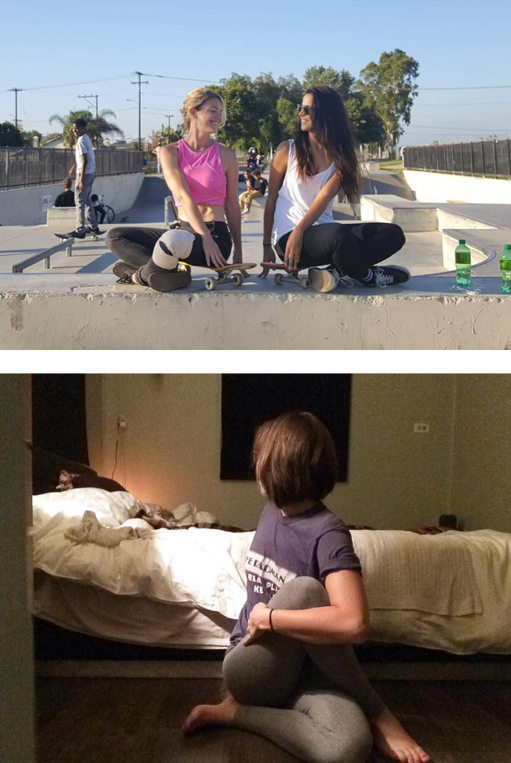 EXPOSURE Skate empowers girls through skateboarding and donates proceeds to Carol’s House (helping survivors of domestic abuse). 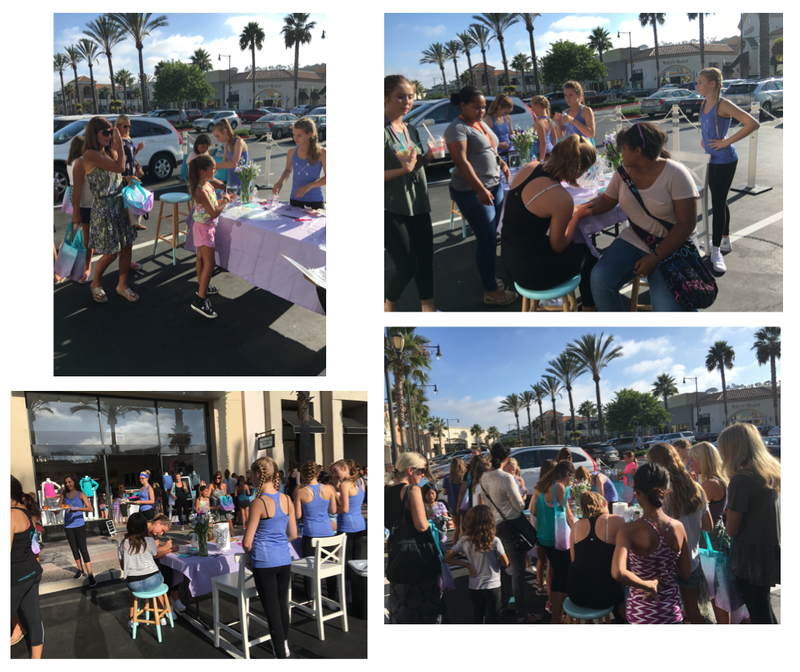 This is the 5th year of girls skate competitions plus Learn to Skate & Yoga Clinics, autograph signings, and a fabulous vendor village. 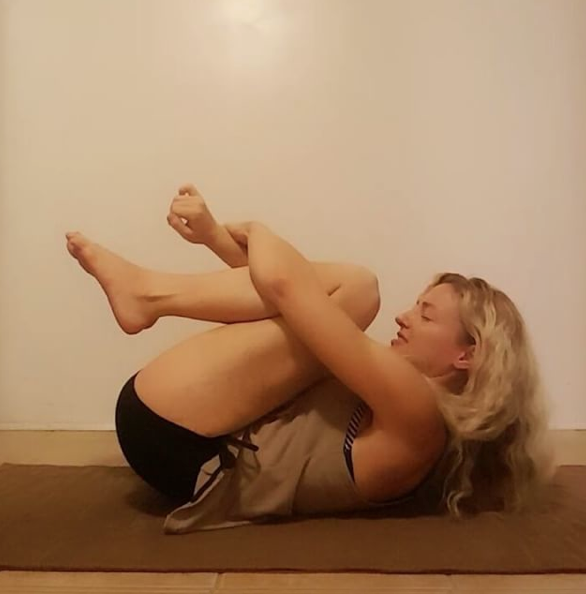 This post is about the EXPOSURE Yoga Challenge. 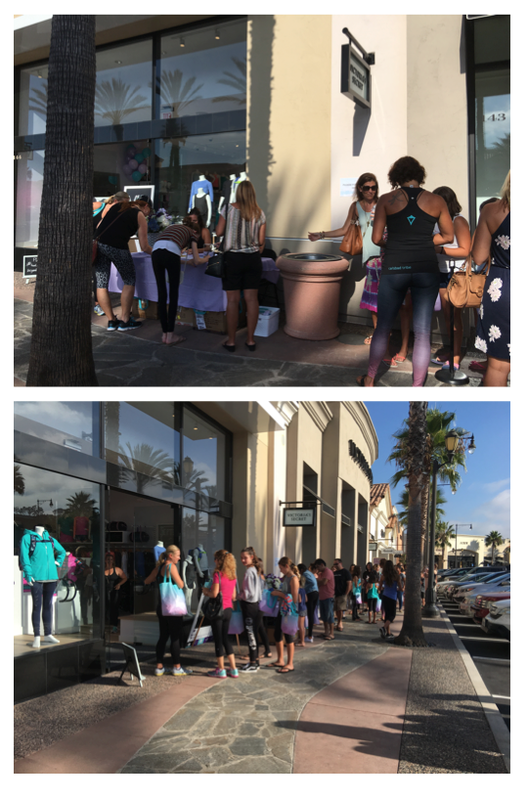 The entire EXPOSURE event is free including the Yoga Clinic – just sign up on the Yoga Registration Page to let Bridget know how many to expect – the yoga clinic is co-ed and from 9 – 10:30 am on 11/5. 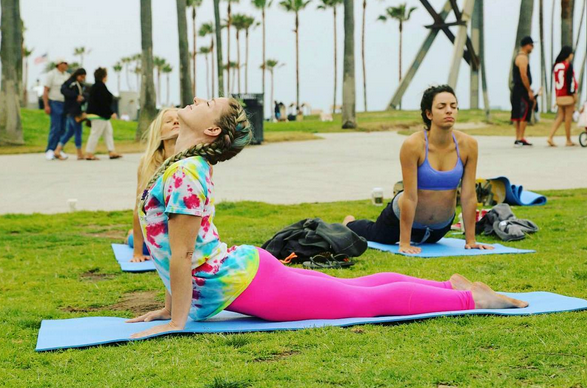 Celebrating 5 years of EXPOSURE SKATE with 5 days of YOGA. 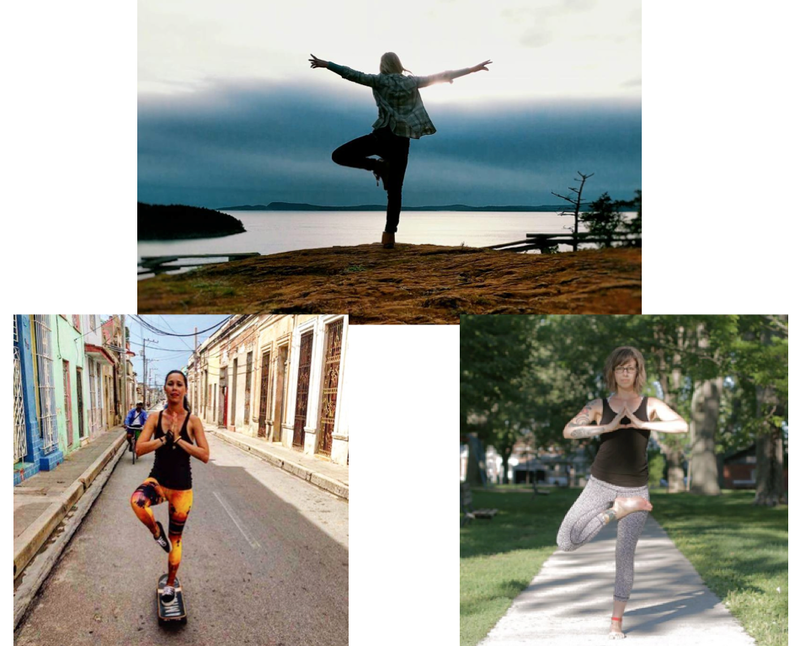 Join our IG yoga challenge for a chance to win prizes! Contest starts October 1st so get following & you’ll have plenty of time to make your posts. 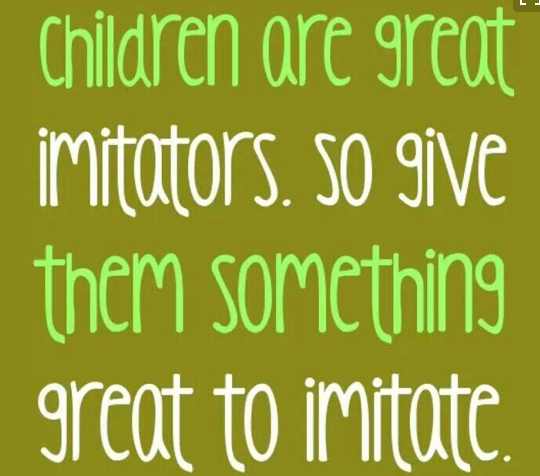 Be creative & have fun! Day 1 is Cobra Pose. There are also 5 yoga principles I am going to touch on each day. Your vehicle won’t go too far without the proper fuel. Sometimes it takes a while to figure out exactly what that is! For me, personally, it has been crucial. I happen to have severe gluten & dairy allergies that effect my immune system. So, for me, finding the proper fuel has meant avoiding these fun foods, unfortunately! But this principle also applies on a much more basic level, like simply making sure you are drinking enough water every day! Above Ting and Sure Foot Yoga share their Cobra Pose just click on their name to see what they had to share. -Stand up straight, stack all your joints; shoulders over hips, hips over knees, etc. Positive thinking doesn’t just mean being happy. To me it means finding contentment even when things in life are not going so well. Everyone has different struggles. Positive thinking helps you to realize that your struggle is not your identity. It is not who you are. and Sure Foot Yoga who is going strong on keeping up with the challenge! 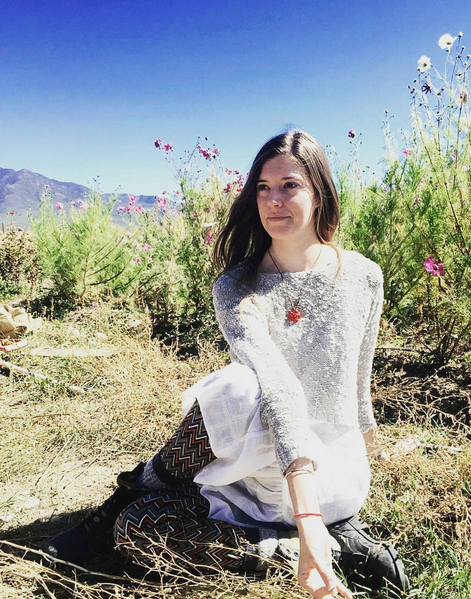 A video from Bridget – watch to see her favorite pose the Savasana which means “corpse pose” in sanskrit – the challenge here is to release all effort from the body & completely relax! 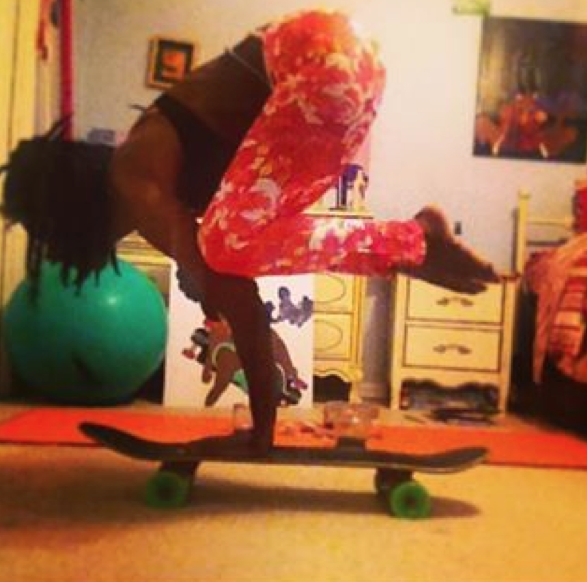 MomIsMyName_5509 shares this Updog for @exposureskate yoga challenge in my fave boardshorts. 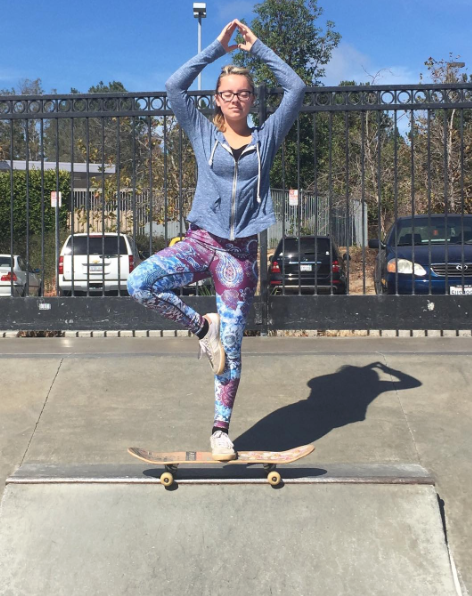 For myself yoga helps with my balance and flexibility, which I’ve been extremely grateful for at the skatepark. 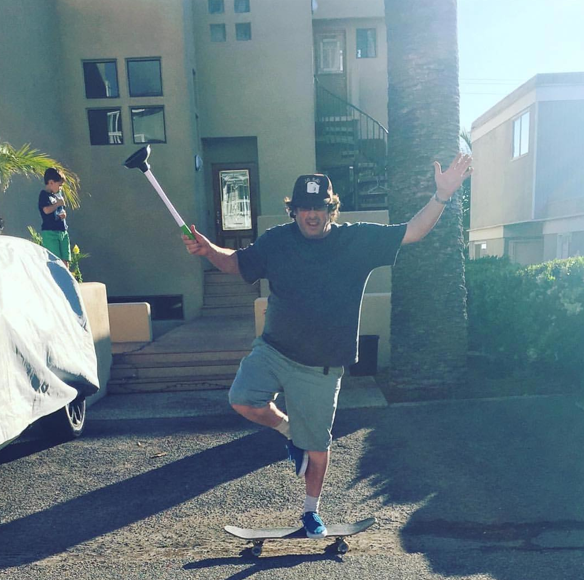 When my board rolled out from under me one day, one foot stayed on the board and I ended up doing the splits. Had I not been flexible from my yoga stretches I could have very well hurt myself, but no harm was done and skating resumed. Good times. 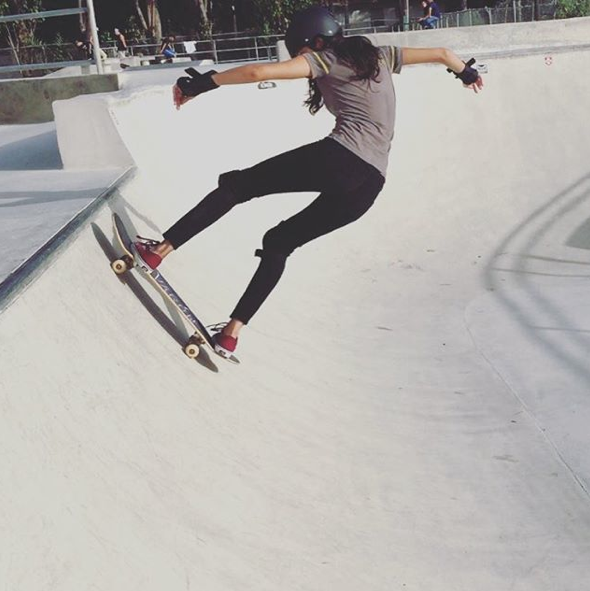 To me skateboarding is rolling yoga so I hope to see lots of people participate in the challenge & at the Clinic – till then keep it stylish on & off the board! I’ve always been thrilled to work with ivivva. 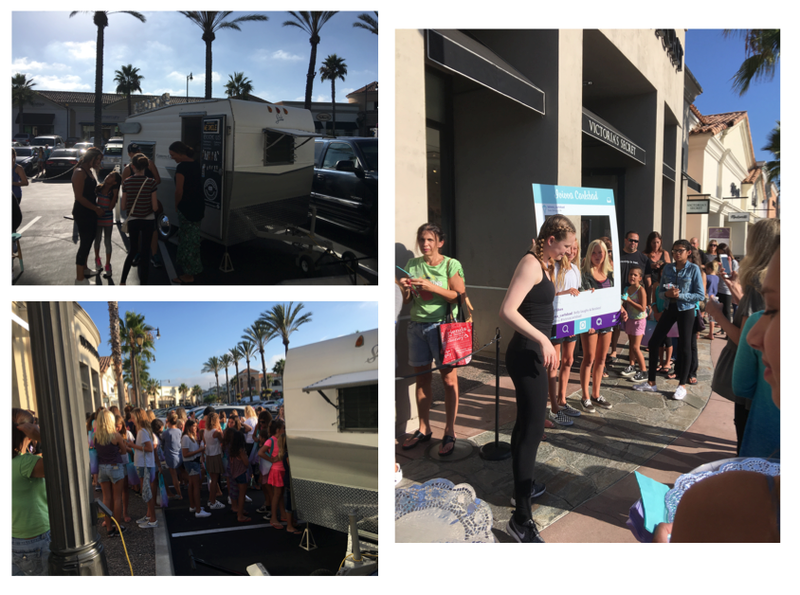 And working the grand opening at the new Carlsbad store on 9/1/16 was thrilling. My mom was kind enough to take photos so here goes my post on the evening. Below the store right before the VIP Event which went from 5 – 7pm. Lisa and the store staff put so much planning into this event. I go to lots of events and this was top notch. In addition to having the store stocked to the brim, they anticipated a huge crowd so they had tons of activities that made the wait fun plus built community. The night started with check in where you received your goodie bag complete with a raffle ticket. The raffle was amazing for several reasons – starting with your stub was already in the bin so you didn’t have to worry is my ticket in. The raffles went on every 15 minutes. The winning numbers were written on the store board – if you weren’t there you have a week to go claim your prize. So if you weren’t there the entire night – I’d go back to the store to see if you won. The jacket below was just one of the amazing prizes, plus you got to pick your prize in your size & color. As more people arrived – the store kept getting busier. 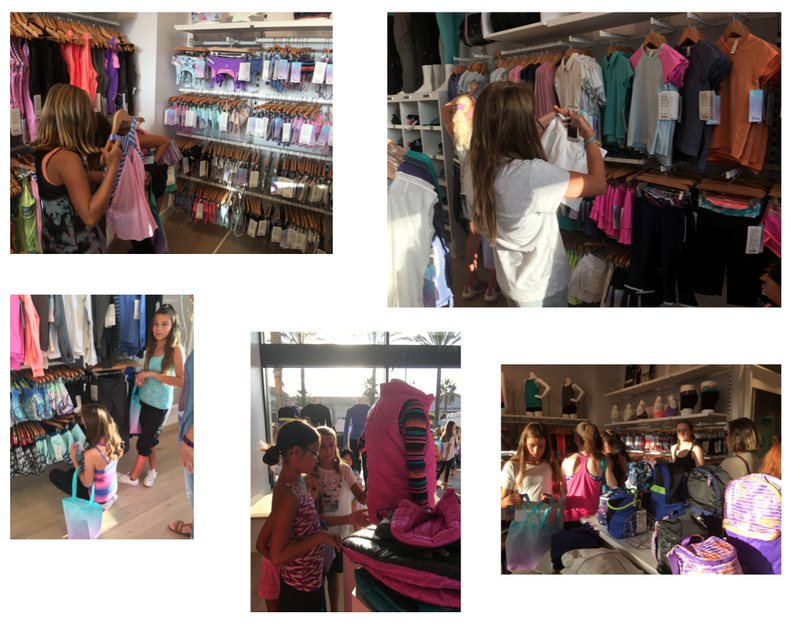 To make sure everyone was comfortable looking at all the selections – tops, shorts, leggings, jackets, backpacks . . . The activities were fun and I believe they built community because I saw people making friends. Below are real life people having fun talking in a fitting room line. Fun in a fitting room line only happens when you’re with friends. And I know I made friends. All the girls in the purple tanks were volunteers – who I met for the first time last night. 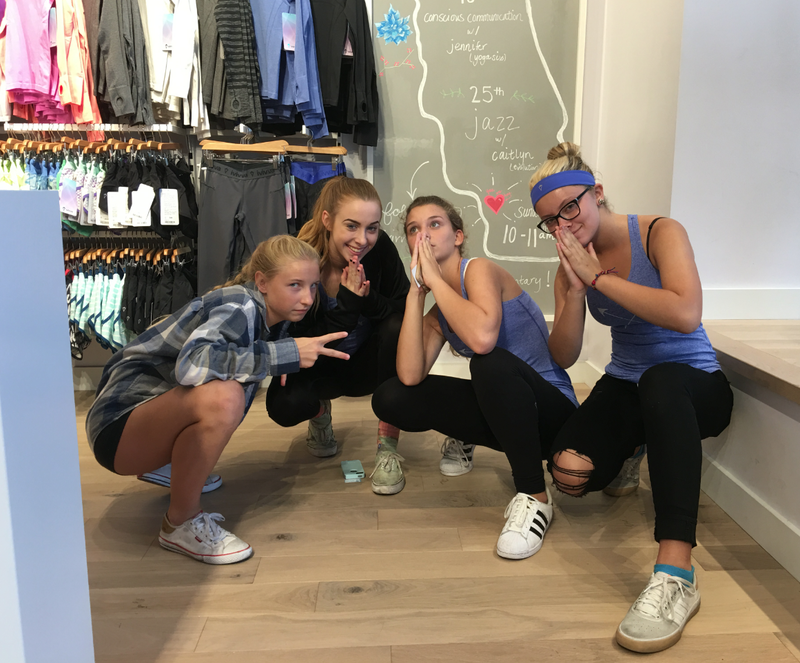 They’re all active girls (Syndi, Maddi, Rheigan, Kayla & Joy) who are passionate about their sport, their fashion, and making a positive impact on the world. Here I am with just a few of them. It’s more than ok to be a girl – it’s something to celebrate. 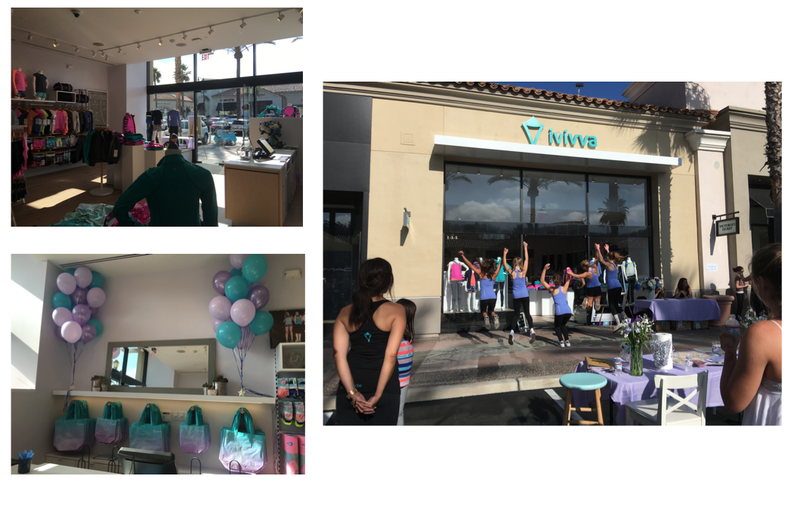 All girls have strength, beauty, and individuality – ivivva celebrates this by designing beautiful athletic wear and giving girls opportunities to meet & connect through movement. 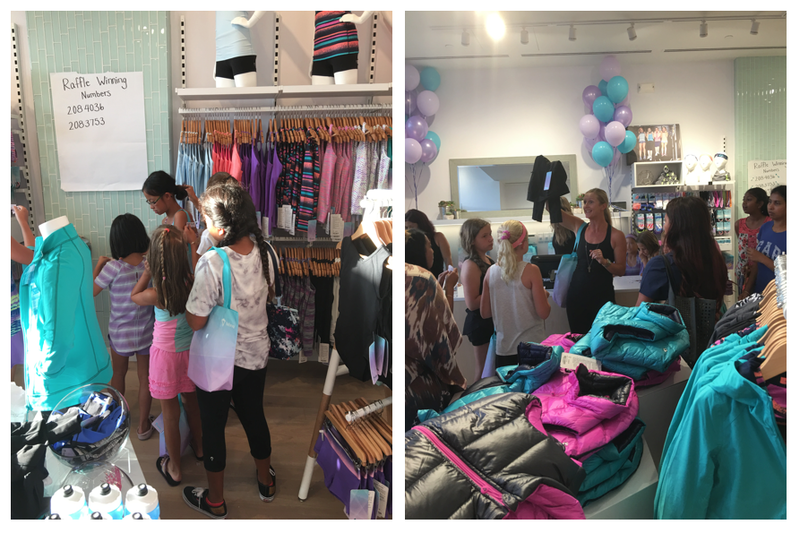 The grand opening last night was just the beginning of how the Carlsbad ivivva store is building a community of strong girls. You can follow them on IG ivivva_carlsbad to see all the activities and when you’re in the store you can look at the board behind us in the picture – written in the map of California are all the monthly events. ivivva communities offer a variety of complimentary athletic classes and Dreams & Goals programs. Through these events girls get to connect and celebrate each other – where they can push their boundaries, knowing that falling and getting back up is all part of the journey. Really incredible to see all the girls working together and that everyone is invited & welcome. Even if you can’t make it like I couldn’t it’s nice to know & see these events. 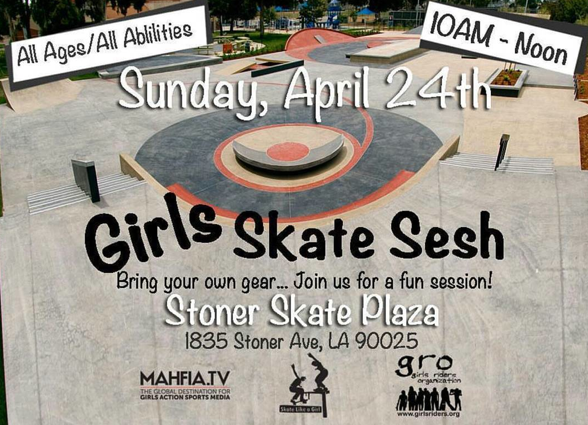 Next session is May 29th at Sheldon Park – hope lots of girls go & then share the pictures – because more girls skate when they see girls skate & we encourage each other! 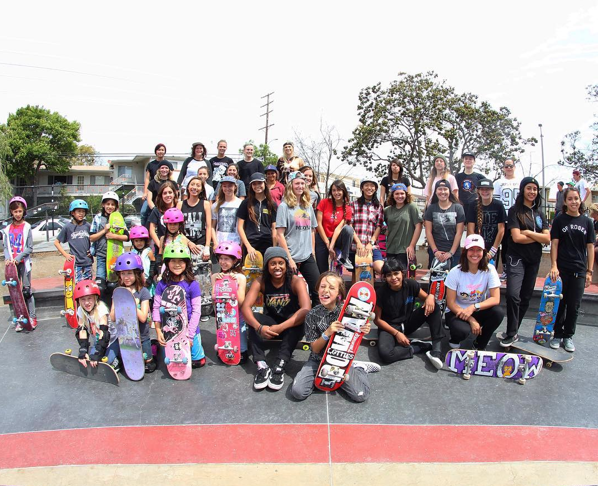 Above Amiga Skate coach Arianna is teaching more girls. 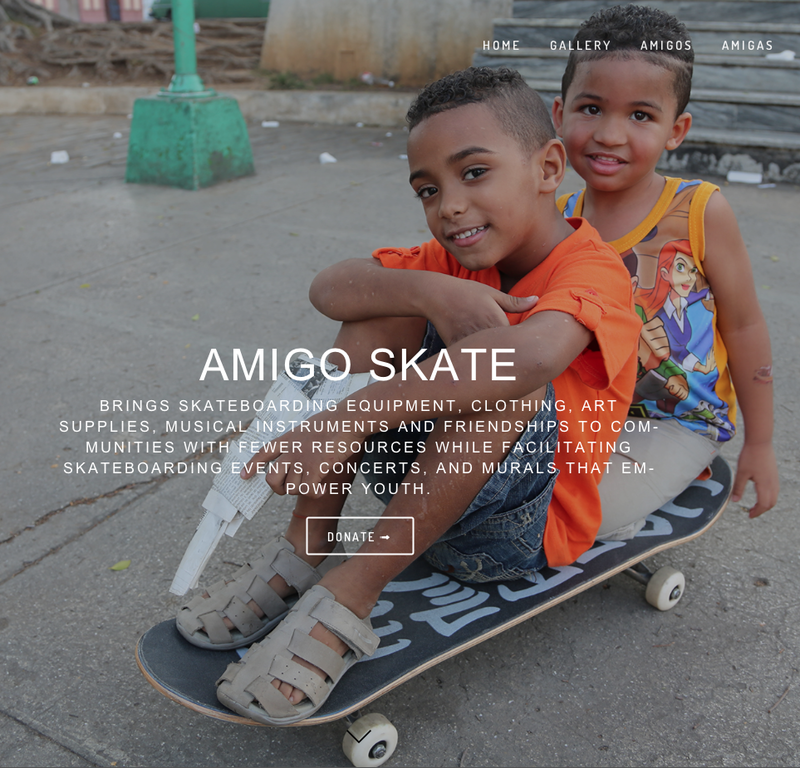 To see many more rad photos check out amigoskatecuba. 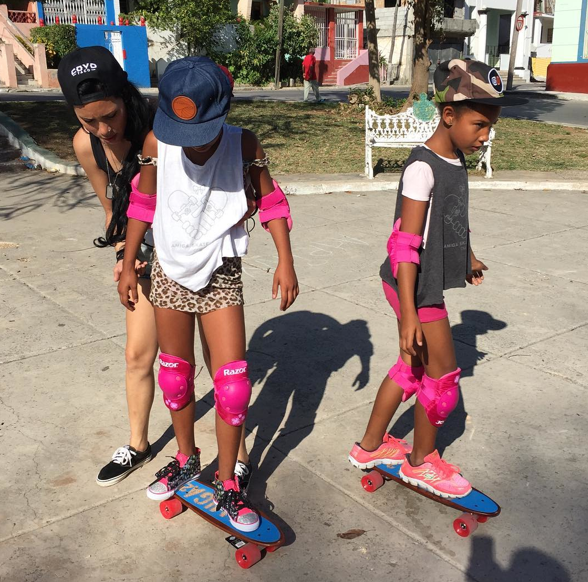 And it’s not just about girls having the opportunity to skate in Cuba. It’s amigos and amigas. 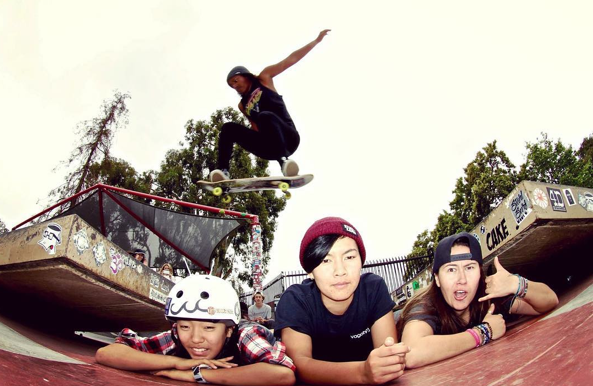 Skateboarding isn’t for boys or for girls who are like boys or bla bla bla – skateboarding is for people. 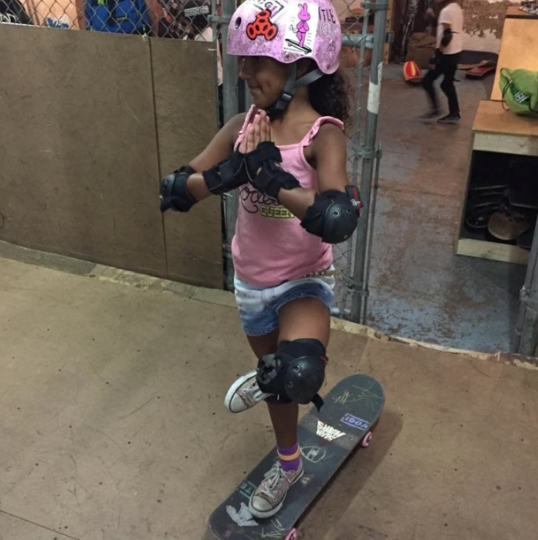 Skate for transportation – skate for exercise – skate because it’s rolling yoga – skateboard because you can and help others skate if they want to. 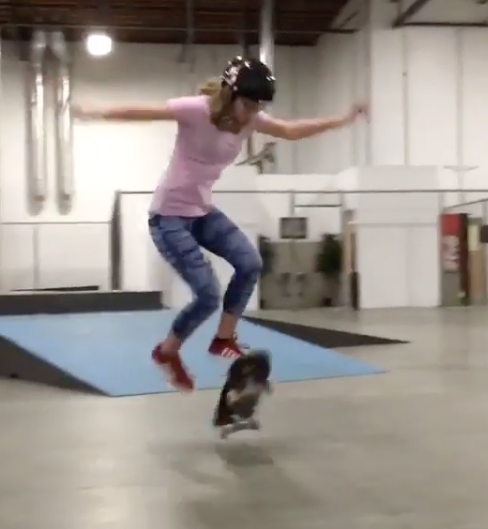 When skateboarding is for everyone – that’s fun – that’s stylish – that’s what I love seeing more of. Also check out and expect more post because the next mission is June 16-23, 2016. 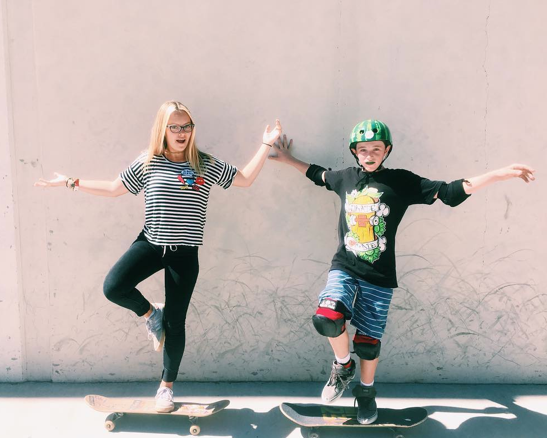 Skateboarding to me is rolling yoga – it’s all about the balance. 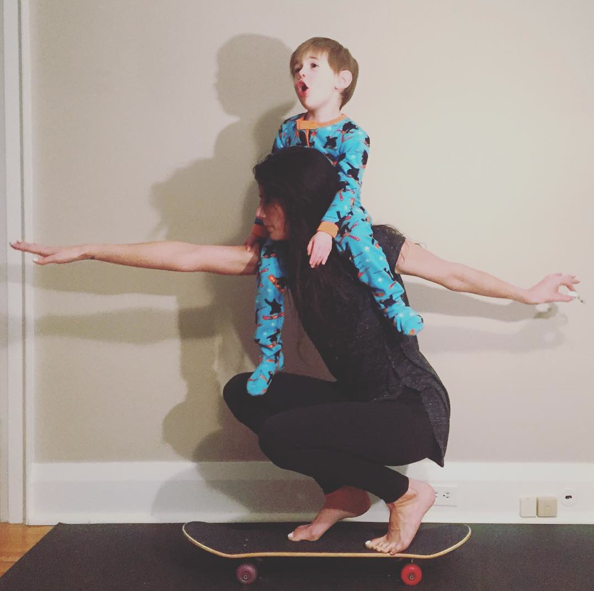 So I love this picture from elle_fit_fashion with the caption Best Skateboarding yoga buddy on the planet! Elle_fit_fashion is actually Laura in Kingston Ontario Canada. 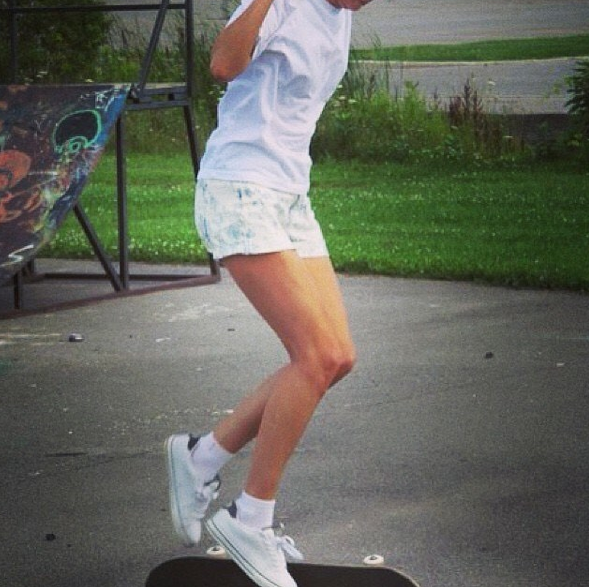 She’s been skateboarding for years – here’s a pic from 2008. So yes, it might get cold in Canada – with a lot of snow – but Laura can still have fun and keep it stylish on her skateboard indoors. 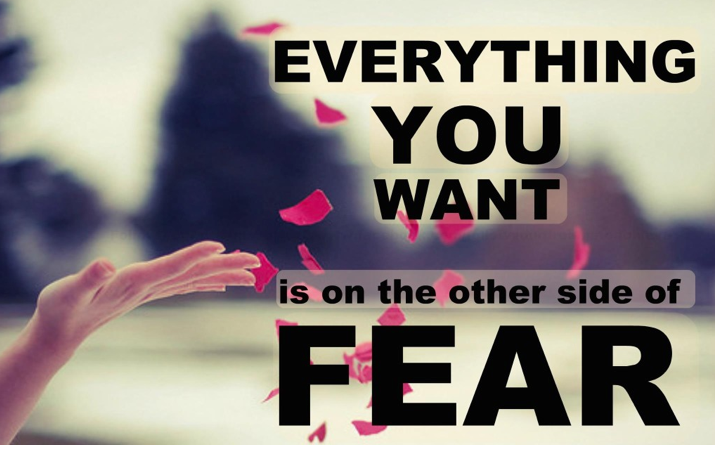 Thanks for sharing Laura your pictures and inspirational quotes. 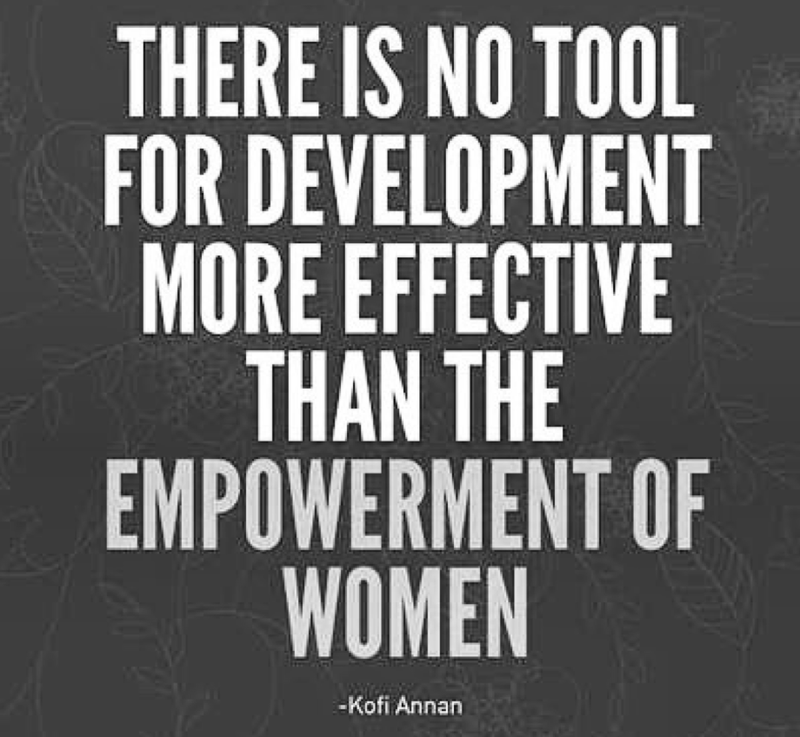 Empowered women, empower women and I’m happy to know you. Iamafrobella shows us that skateboarding & yoga definitely work together. It’s all about balance & finding your center. Plus why not mix your passions & of course keep it stylish. 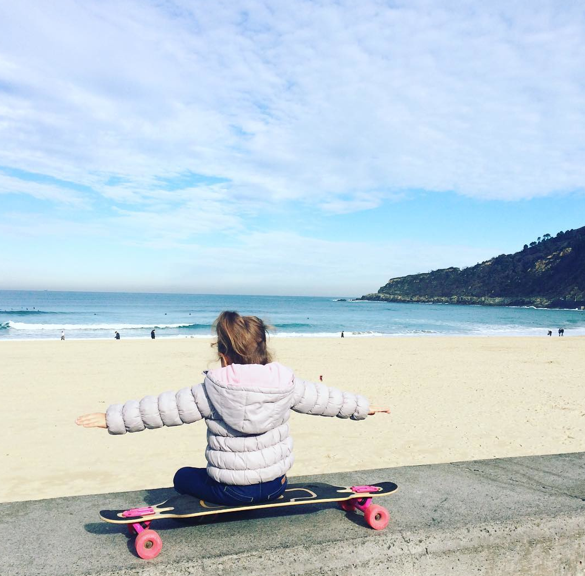 Where and how are you skateboarding aka rolling yoga? 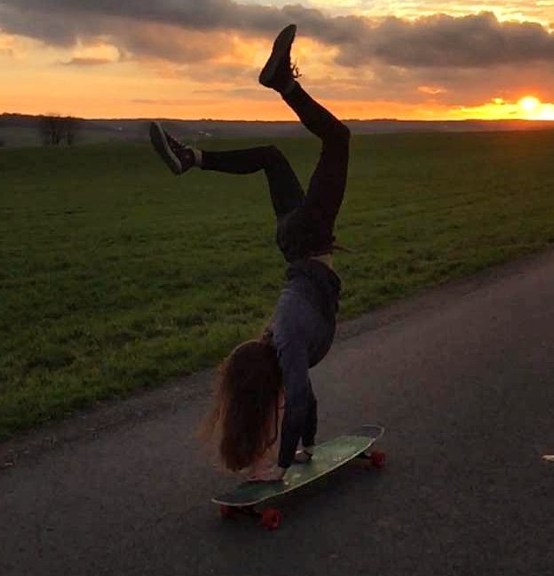 More girls skateboard when they see it can be this fun & stylish.